Wildwood Green Golf Club is an upscale Semi-Private golf facility with 18 masterful holes and includes a driving range, a putting green, a chipping area and practice bunker.With PGA Professionals on Staff Wildwood Green sets itself apart by providing “Quality Professional Golf Services, All The Time, Every Time.”We also hold tournaments, some competitive and some just for fun, year round. If all you want to do is GOLF, all you want to do is HERE! If you love the game of golf, move away from it all to Wildwood Green Golf Club. 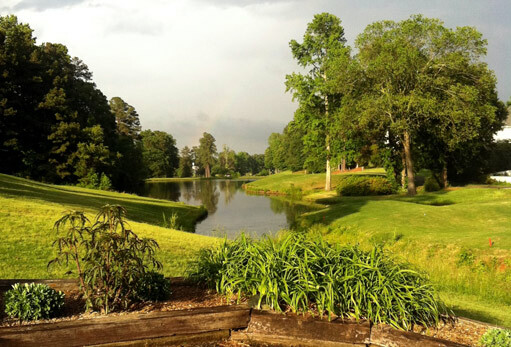 Just relax and play the best games of your life at one of the finest tests of golf in Raleigh. Originally established in 1986, Wildwood Green’s beautiful terrain of rolling green and woods is a peaceful sight to the eye. We made a great thing even better completing a major redesign in 1996. Wildwood Green was created with all players in mind. Our course consists of 4 sets of tees for all skill levels. Whether you are looking for a place to spend a beautiful afternoon or a lifetime of beautiful afternoons, escape to Wildwood Green Golf Club soon. Stretching to 6500 yards from the back tees, our par 70 layout is challenging enough for the best players yet still fun for the occasional golfer. We have four sets of tees for the player to choose the one best suited to his/her enjoyment of the game. Generous landing areas allow some margin of error from the tee although there is no shortage of trees and traps. While large greens provide a tempting target for your approach shots, you also need a skilful touch to get the ball in the hole.